Is your child ready to be potty trained? It’s a question parents often start to ask themselves as their child approaches their 2nd birthday or 3rd birthday. Potty training shouldn’t be rushed, but you also want to make sure that you are prepared to encourage your child to start the training process as soon as they start to show an interest. 6. Telling you that they’re about to go, are going or have just gone in their diaper. If you're seeing several of these signs, congratulations! You're observing behaviors that indicate you and your little one are ready to move forward with your potty training journey. To make sure you're prepared to get started, put together a potty training kit so you can set them up for a success and help make this process as smooth as possible. A small potty or child potty seat, which your child can pick one out online or in a local store. A step stool to make it easy for your child to reach the sink to wash their hands, and to rest their feet on if they go on the big toilet. Pull-Ups® Training Pants, which are great for giving children the independence to easily go to the potty on their own. 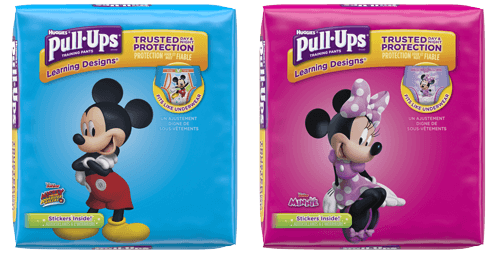 Pull-Ups® Big Kid* Flushable Wipes, which help you child feel cleaner than with toilet paper alone. They're septic safe and break up after flushing. Underpants in your child’s favorite colors or with their favorite characters on them. Fun foamy soap to make hand-washing part of the potty training routine. Elastic waist bottoms since snaps and buttons are difficult for kids to undo. Keep it simple so kids can feel confident and quickly access the potty. A reward chart with stickers and other small prizes can go a long way in keeping your child on track and excited. Your trusty diaper bag, which will now be your trusty potty training bag. A change of clothes for your child just in case of accidents. A portable potty seat that can fit over a regular toilet seat in public restrooms. Stickers or other small treats that you are using as rewards. You could also use an added bonus as your child's potty training on-the-go incentive. Pull-Ups® Training Pants. Even if your child has been using underpants, it;s okay to resume using Pull-Ups® if you're on a trip. Using Pull-Ups® can give you and your little one peace of mind if there's an accident. Being prepared for the potty training process – whether at home or while traveling – will help you and your child feel calmer and more confident. With the right tools and materials, plus a game plan, you will be setting up your child for potty training success. Will Traditional Potty Training Methods Work for My Family?